Two recent Duquesne graduates are turning their education into a successful business that is already helping clients maximize return on their investments. 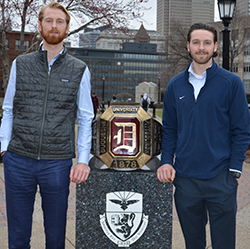 After earning bachelor's degrees in finance in 2016, Max Knape and Samuel Frymier founded Quesne Capital, a fledgling quantitative research and asset management firm located just blocks from campus. The idea for thier company emerged from their senior capstone course, Investment Environment, which focuses on designing quantitative models that attempt to outperform the market. They develop long-term strategies, identifying common attributes shared by stocks that have tended to do well over time. Following graduation, both Knape and Frymier had job offers they mulled over and eventually declined. Instead, they took their sound investment strategy and finalized their business model. They received their license from the Pennsylvania Department of Banking and Securities in January 2017. "We are entrepreneurial people, competitive at heart. Instead of accepting already published knowledge, we built upon and improved it by doing our own empirical research," Knape says. Frymier adds, "We were hungry for answers. Essentially, we combined the classic theories of value investing and behavioral finances with quantitative modeling techniques." Both of them credit the education they received at Duquesne, and Vashishta Bhaskar, assistant professor of finance in particular, for helping to make it happen. "It is such a good environment there, for learning and growing," Knape said. "All the tools are there for you. It's whether you choose to use them." Professor Bhaskar noted that it's quite unusual for undergraduate students from Duquesne to start a business from scratch. "What made them different is their willingness to take calculated risks. They had a clear focus to develop the business and think big." Bhaskar said of his former students. "It is about overcoming challenges using intellect, data and skill. Finally, and most importantly, it is about implementing the plan, something that Frymier and Knape have done extraordinarily well so far."